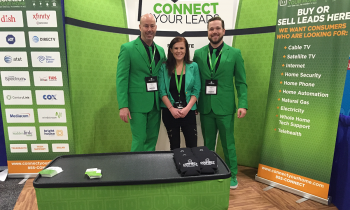 If you're going to attend Affiliate Summit West 2017, you won't want to miss the chance to meet with Connect Your Leads and possibly walk away with a gold coin! Ryan Grier and Chris Hoffner will be representing Connect Your Leads at the conference and meeting with any attendees who want to learn how to turn their leads into gold. They both have a long history in lead generation and performance marketing, and they're excited to discuss partnership opportunities or industry trends with anyone and everyone. You'll find them at table G7 during the Meet Market on Jan. 15 from noon to 6 p.m., or they'll be available to chat all the way through Jan. 17. They shouldn't be hard to find considering they'll be wearing eye-catching green jackets. Also during the Meet Market, you'll be able to enter to win a genuine gold coin just for chatting with our team. Trust us, your odds of leaving Vegas with that gold coin are much better than playing most of the casino games! If you're not going to be at Affiliate Summit, you can contact us anytime to learn how working with us provides an immediate boost to your business.